Another year has passed and welcome to a new year! The new year starts with a mix of movies. Mark Wahlberg stars in “Contraband” while if you’re looking for a more cheerful movie…Queen Latifah and Dolly Parton star in “Joyful Noise”. The rest of the month is all about the thrillers. Ewan McGregor (“Moulin Rouge”), Antonio Banderas (“Desperado”), Michael Douglas (“Wall Street”), and Channing Tatum (“G.I. Joe: The Rise of the Cobra”) headline “Haywire” which looks like a cross between Alias and The Bourne Ultimatum. The film is directed by Steven Soderberg, amongst his credits include Ocean’s Eleven and Traffic. Other thrillers being released this month include that latest in the Underworld franchise, “Underworld Awakening”, Liam Neeson starring in “The Grey” and Sam Worthington (“Avatar”) stars in “Man on a Ledge”. At the end of the month it’s the movie release of “One for the Money”. Fans of the books have been very vocal about the casting choices but the film is complete. Originally the film was suppose to be released in Summer 2011, but it was pushed back. Good move or bad move…we shall see. I think there is enough curiosity surrounding it that people are going to go out and see it. My spotlight pick of the month is T“Beauty and the Beast” 3D. This could be a big hit considering the success of bringing back “The Lion King” in 3D last year. I think the film will look great in 3D, especially the ballroom scene. Well that’s my January overview, click on the link below to check out the rest of the movies coming out this month and check back next month for more Winter Movie Season picks and if you’ve seen any of the films from this month…leave some feedback/suggestions in the Comments section on what to see. Check out the new teaser trailer for “Salt” starring Academy Award winner Angelina Jolie. Full cast list can be found here. Evelyn Salt (Angelina Jolie) is a CIA officer who swore an oath to duty, honor, and country. When she is accused by a defector of being a Russian sleeper spy, Salt goes on the run to clear her name and ultimately prove she is a patriot. Using all her skills and years of experience as a covert operative, she must elude capture and protect her husband or the world’s most powerful forces will erase any trace of her existence. “Salt” hits theaters this summer on July 23, 2010. This movie looks pretty good. It kind of reminds me of a cross between the TV series “Alias” and “The Bourne Ultimatum”. I think it will be something to look out for during the Summer Movie Season. According to the Hollywood Reporter, there has been a bidding war amongst the TV networks for J.J. Abrams’s new spy drama. The show, whose premise is somewhat reminiscent of “Mr. and Mrs. Smith,” sparked a bidding war the moment it hit the marketplace last week, with ABC, NBC and CBS jockeying up for the lead position. Read the full article here. It looks like the project has gone to NBC. Could this be Alias 2.0? I guess we shall see. What do you get when you mix a Gary Marshall film star reunion with ABC stars both past and present? The product is “Valentine’s Day”. Former “Alias” stars Bradley Cooper and Jennifer Garner, Julia Roberts, Anne Hathaway, “Grey’s Anatomy” stars Patrick Dempsey and Eric Dane, and Twilight’s Taylor Lautner are just a few of the all-star cast members in this movie. Full cast list can be found on IMDB.com. 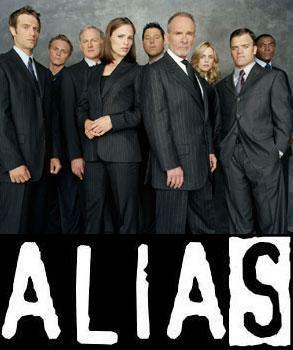 Even though the show is over, the former cast of “Alias” have certainly flourished in their careers. Jennifer Garner has a growing film career and she has her own production company. Michael Vartan is on the TNT show “Hawthorne”. Greg Grunberg is on NBC’s “Heroes”, and Bradley Cooper is having a breakout year with his recent summer hit “The Hangover” and many upcoming movies on the way. Thus I created a new category on my blog called the “Alias Alumni Watch” so whenever a former cast member has something new or noteworthy – you will be able to view all posts with “Alias” references in this new blog category. Keep and eye out for updates made in the “Alias Alumni Watch” category in order to stay up-to-date with your former “Alias” cast members’ careers! “The Invention of Lying” Trailer and More! “The Invention of Lying” stars Jennifer Garner and Ricky Gervais in a comedy where no one has ever lied, until a writer (Gervais) seizes the opportunity for personal gain. Gervais co-wrote and directed the film. For more information on the movie, visit the official website. “The Invention of Lying” hits theaters on October 2, 2009. Full cast list can be found on IMDB.com. Garner and Gervais have worked together before. Gervais guest starred on an episode of “Alias” back in 2004 where he played a very convincing villain. Great episode! Access Hollywood caught up with Garner and Gervais on the set of the movie and asked the stars “What’s The Worst Lie You Ever Told”? Click on the link below to watch the interview. Click to Continue Reading: “The Invention of Lying” Trailer and More! “Mission Impossible: IV” already has its producers set with J.J. Abrams and Tom Cruise, now the writers have been chosen as well. Josh Applebaum and Andre Nemec will be writing the script for “M:I 4”. Both Applebaum and Nemec have worked with Abrams before as co-executive producers on the ABC show “Alias”. Read the full article on Variety. Who will be the “Green Lantern”? Ryan Reynolds has been cast as the Green Lantern. Read the full post here. The latest comic book to movie adaptation looks to be the “Green Lantern”. According to the Hollywood Reporter, Warner Bros. have three front-runners in mind. They are Bradley Cooper (“The Hangover”), Ryan Reynolds (“X-Men Origins: Wolverine”), and Justin Timberlake. Other candidates mentioned include Henry Cavill (“The Tudors”) and Jared Leto. Interesting choices for the Green Lantern. Upon first glance, I would say Ryan Reynolds would look the part but considering he will be starring in the X-Men Origins spin off Deadpool – there could be some filming conflicts. In my opinion, Bradley Cooper has really emerged as a rising star in Hollywood within the past few years. His latest movie, “The Hangover”, has already grossed $210 million domestically and a sequel is already in the works according to this Variety article. I believe Cooper’s breakout role was on the ABC show “Alias” starring Jennifer Garner. “Alias” is one of my all-time favorite shows and I’m glad that the show’s alumni have really done well after the show ended in 2006. As far as Justin Timberlake, I don’t know if I see him as a super hero. I can understand the commercial appeal of choosing him, Timberlake has starred in some dramas (i.e. “Alpha Dog”) and comedies (i.e. “The Love Guru”), but I don’t know if he’s a fit for the role. On the other hand, I can totally picture Henry Cavill as the Green Lantern. Cavill has been linked to many super hero roles including Superman before Brandon Routh was ultimately chosen for “Superman Returns”. Stephenie Meyer, author of the “Twilight” book series, mentioned on her official website that Cavill was part of her dream cast before Robert Pattinson was cast as Edward Cullen for the movie. Cavill is currently starring as Charles Brandon, on the TV series “The Tudors”. As with all the other super hero franchises, you need someone that can carry a franchise (i.e. sequels, merchandising, etc.) so my vote goes toward Henry Cavill! What do you think?